For pre Wembley event lunches and dinners please complete our quick online enquiry below or call 02087339000. 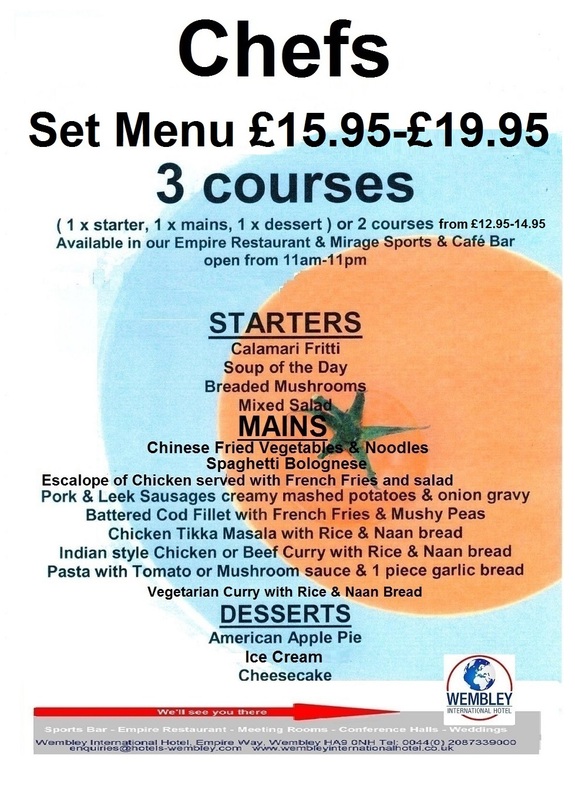 Empire Restaurant Wembley is a brilliant choice for a Wembley Restaurant pre SSE Arena, Wembley event restaurant dinners open from 11am until late. Empire Restaurant Wembley is only 5 minutes walk to The SSE Arena, Wembley and a great choice for pre SSE Arena Wembley event dinners. The Empire Restaurant at Wembley International Hotel only 5 minutes walk from Wembley Park Underground Station, The SSE Arena, Wembley, Wembley Stadium and Wembley Theatre. Because of the high demand for parking at our hotel, onsite parking is unavailable to non resident guests who wish to dine in our Empire Restaurant or Mirage Sports Bar. For groups coach Drop off and Pick up only at the perimeter of the hotel is permitted for coaches and minibuses for non resident groups of guests who wish to dine in our Empire Restaurant.